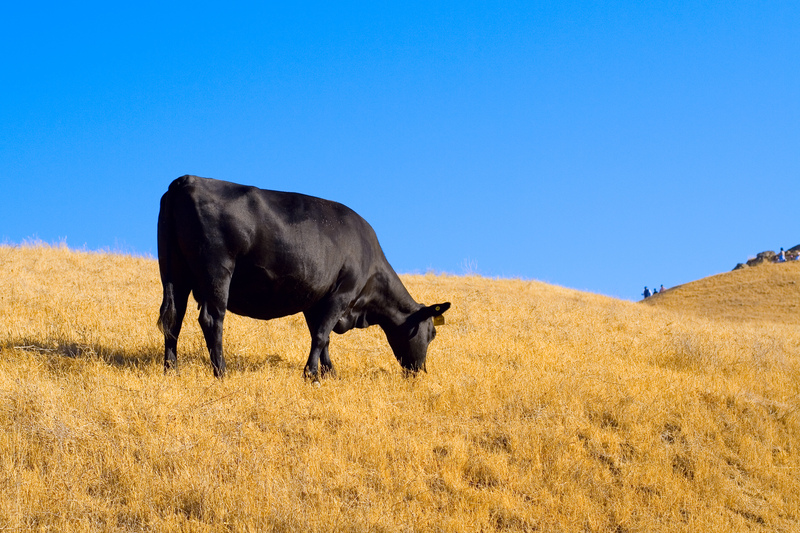 Eating grass-fed beef and pasture-raised chicken is the eco-friendly thing to do–right? Maybe not, according to a recent paper published in the Proceedings in the National Academy of Science. The study proposes that intensifying livestock production by transitioning from pure grazing to mixed systems–where animals are fed high-energy food like grains–could reduce livestock greenhouse gas emissions by 23% by 2030. Currently, livestock account for 14.5% of all anthropogenic greenhouse gas emissions, so such a reduction would be significant. In contrast, a comment piece that appeared in Nature last month calls for increasing grazing to make livestock systems more sustainable. Of eight strategies that the authors outline to reduce the environmental and economic costs of raising livestock, “Feed animals less human food” is number one. But growing that feed has an environmental cost too. Feeding animals human food is inherently inefficient in an energy sense, since only a small portion of the calories an animal takes in through food gets converted into calories in its meat. By grazing ruminants–animals like cattle, sheep, and goats that can digest tough fibers that are inedible to humans–we can gain access to more calories. It doesn’t seem like we’ve found the perfect system for sustainable livestock yet. There are too many factors–not just greenhouse gas emissions and land use, but pollution caused by animal waste, water use, food security, and of course economic sustainability. The good news is that there’s plenty of work being done by researchers and farmers who want to help find solutions. In the meantime, should we go for grass-fed or grain-fed? I find the grazing argument more convincing, but you’ll have to read the articles to decide for yourself. One thing that the authors of both papers agree on: the impact on the environment would be lower if we all ate less meat and dairy. Listen to an interview with two of the authors on the Nature podcast.